Let these Gandhi quotes encourage you and give you words of wisdom to consider. Mahatma Gandhi was born in Gujarat, India and was an activist who inspired many for civil rights and freedom across the world. He truly was an inspiration for many. His words still motivate people today to stand up for what is right. 1. A man is but a product of his thoughts. What he thinks he becomes. 2. Numerous examples have convinced me that God ultimately saves him whose motive is pure. 3. You must not lose faith in humanity. Humanity is like an ocean; if a few drops of the ocean are dirty, the ocean does not become dirty. 4. The difference between what we do and what we are capable of doing would suffice to solve most of the world's problem. 5. The more I reflect and look back on the past, the more vividly do I feel my limitations. 6. 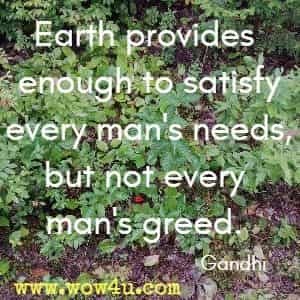 Earth provides enough to satisfy every man's needs, but not every man's greed. 7. Carefully watch your thoughts, for they become your words. 8. To see the universal and all-pervading Spirit of Truth face to face one must be able to love the meanest of creation as oneself. And a man who aspires after that cannot afford to keep out of any field of life. 9. I will not let anyone walk through my mind with their dirty feet. 11. The best way to find yourself is to lose yourself in the service of others. 12. The outstanding impression my mother has left on my memory is that of saintliness. She was deeply religious. She would not think of taking her meals without her daily prayers. 13. Hate the sin, love the sinner. 14. I do not remember having ever told a lie during this short period either to my teachers or to my schoolmates. I used to be very shy and avoided all company. My books and my lessons were my sole companions. 15. 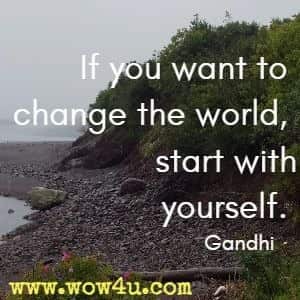 If you want to change the world, start with yourself. 16. A clean confession, combined with a promise never to commit the sin again, when offered before one who has the right to receive it, is the purest type of repentance. 17. O God, thy law is mysterious. Wherever the heart is set, there thou art to be seen; with thee there is neither temple nor mosque. Thou lookest only for a true heart in thy seeker. 18. The weak can never forgive. Forgiveness is an attribute of the strong. 19. There are some things which are known only to oneself and one's Maker. These are clearly incommunicable... But they are spiritual, or rather moral; for the essence of religion is morality. 20. Live as if you were to die tomorrow. Learn as if you were to live forever. 21. There are innumerable definitions of God, because His manifestations are innumerable. They overwhelm me with wonder and awe and for a moment stun me. But I worship God as Truth only. 23. The seeker after truth should be humbler than the dust. that even the dust could crush him. Only then, and not till then, will he have a glimpse of Truth. 24. Prayer is not asking. It is a longing of the soul. It is daily admission of one's weakness. It is better in prayer to have a heart without words than words without a heart. 25. I am of opinion that all exclusive intimacies are to be avoided; for man takes in vice far more readily than virtue. And he who would be friends with God must remain alone, or make the whole world his friend. 26. Glory lies in the attempt to reach one's goal and not in reaching it. 28. God speaks to us every day only we don't know how to listen. 29. My life is one indivisible whole, and all my activities run into one another, and they all have their rise in my insatiable love of mankind. 30. Happiness is when what you think, what you say, and what you do are in harmony. 31. Whenever you are confronted with an opponent, conquer him with love. 32. Ask the poor. They'll tell you who the christians are. 33. As human begins, our greatness lies not so much in being able to remake the world- that is the myth of the atomic age- as in being able to remake ourselves. 34. The future depends on what you do today. 35. There is no way to peace, peace is the only way. 36. Numerous examples have convinced me that God ultimately saves him whose motive is pure. 37. 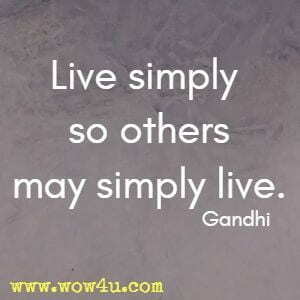 Live simply so others may simply live. 38. The greatness of a nation and its moral progress can be judged by the way its animals are treated. 39. It is health that is real wealth and not pieces of gold and silver. 40. Many people, especially ignorant people, want to punish you for speaking the truth, for being correct, for being you. Never apologize for being correct, or for being years ahead of your time. If you're right and you know it, speak your mind. Speak your mind. Even if you are a minority of one, the truth is still the truth. 41. You can chain me, you can torture me, you can even destroy this body, but you will never imprison my mind.